The American college experience is unique: wearing sweatpants for 300 days straight, dressing as a golf pro and/or tennis ho on at least 11 occasions, purchasing overpriced Sociology of Sports textbooks, and definitely attending every class, especially the morning ones. 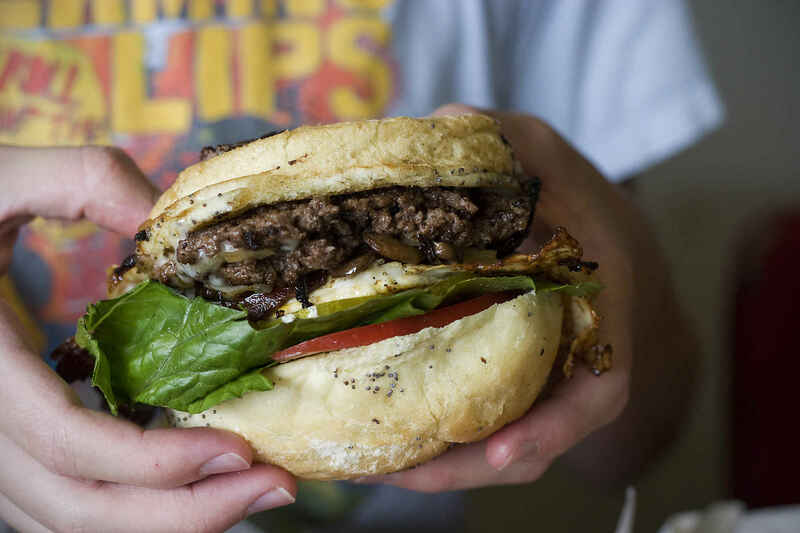 Since our love of burgers is just as singular, it makes all of the sense that, at the start of the collegiate year, we yet again celebrate the best burgers in towns filled with students carrying overpriced textbooks while wearing sweatpants. Some college legends remain on the list from last year while some are newer spots that've forged their way into our hearts and stomachs. Tuck a napkin into your shirt so your pledge tie doesn't get dirty, and dig in. At this point, Austin's a food mecca: not just for brisket, tacos, and more brisket, but for steaming bowls of ramen, espresso from small-batch roasters to please even the most uppity coffee snobs, and, of course, burgers. The only move for UT students though lies at Crown & Anchor, a spot whose gravel parking lot is always packed, whose beer is college-style cheap, and whose burgers have just the right level of melty cheese, crispy bacon, and char-grilled perfection to make it legendary in the city. Chuck's is one of those quintessential college dive bars: it's covered in graffiti, that stickiness clinging to the bottom of your shoe could be from a beer spilled when John Mackey was an Orange, and the beer specials are made for people without any income. Which also means the burgers are delicious: whether you go for half-price Mondays or not, grab the bacon cheeseburger, add blue cheese, and get there early enough to hog the dart boards for a long night of pitchers. Sobelman's is undeniably Milwaukee, which means the beer selection is enviable (think selections from local breweries like nearby New Glarus or Madison's Ale Asylum) and the burgers are giant and do not skimp on the cheese or bacon. If it's your first time, go with the namesake: it's far from regular, layering American, Swiss, and cheddar on top of bacon, fried onions, and jalapeños. Then, just go ahead an transfer to Marquette: you're going to want to try the rest of this menu. First of all, great name. Second of all, aside from Harvard students, the burger cottage has been visited by many famous people, like Katie Couric. Third of all, it constantly updates its names to stay current, like the Roger Goodell Booooo! and the Hashtag. We are partial, however, to one that feels more like a punchline from 2013: the Rob Ford ("he CRACKS me up") comes with Swiss, grilled sauerkraut, Russian dressing, and several bonus overheard comments about punching The Porc. Oxford's one of those quintessential college towns that every admissions officer dreams of putting on the brochure: town square! Blonde cheerleaders! Famous novelist references! But it also has insane food options, starting with Chef John Currence's fine-dining options and moving down to Handy Andy, a BBQ spot that does a damn good pulled pork sandwich and a burger that is even better. 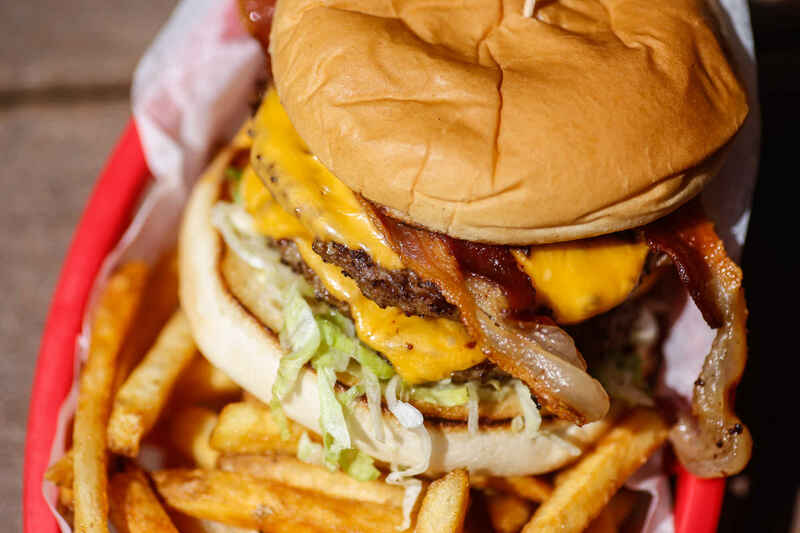 Order the double cheeseburger -- it's a simple, greasy, delicious meal that is exactly what you'd expect from a bare-bones Southern spot -- and then maybe just get some 'cue to go since you're already there. Or another burger. Your call. Despite the fact that this one is not the original White Hut, it is still a White Hut, and that makes it the best burger place in any college town. But aside from that biased little editorial, the Amherst location has been around long enough to have attracted a clientele of Minutemen, Lord Jeffs, and whatever Hampshire College's mascot is. And if they know what's good for them, they're ordering two cheeseburgers with grilled onions and nothing else. Last year, we hemmed and hawed before selecting the Peanut Barrel's fantastic Rodeo burger for East Lansing. 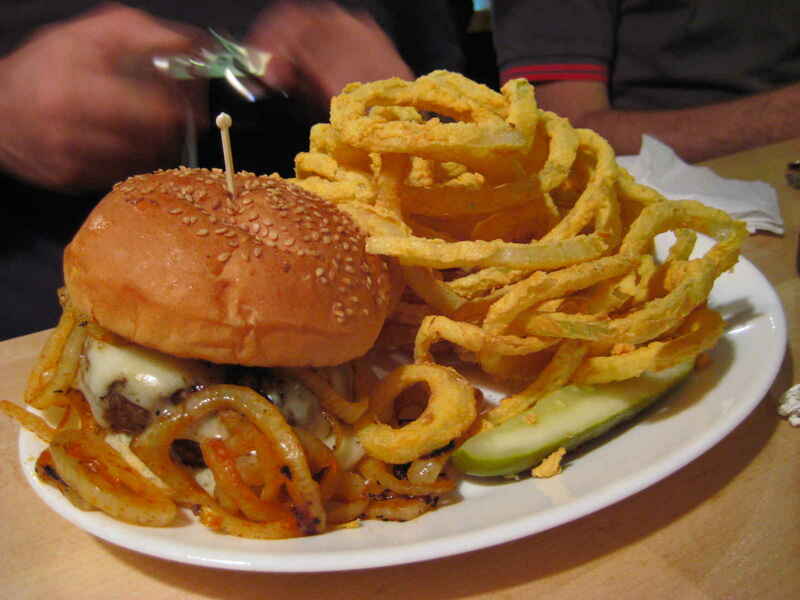 This year, though, our hearts -- our beef-addled hearts -- returned to Crunchy's. Maybe it's the nostalgia of seeing your name carved into the wall. Maybe it's the fact that you've just split a mop bucket of craft beer with somebody at what, pre-Hop Cat, could be considered Spartan Country's original craft beer bar. Or maybe it's the fact that the char-grilled half-pound Crunchy burger is basically a picture of what a burger should be, a solid, juicy patty that stands on its own without relying on a bunch of stupid toppings. Unless you want those. In which case the place has them. And also pizza nuggets. And karaoke. Because Crunchy's is kind of the best. At least our editor thinks so. 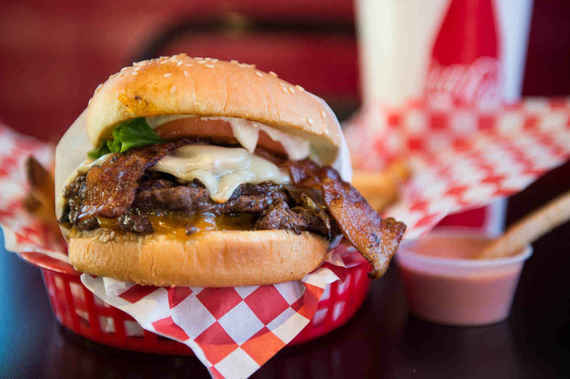 Memphis tends to get its name on any burger lists thanks to Dyer's, a Beale St legend that deep-fries its burgers in the same grease that was used when the spot opened. But Ubee's, a late-night spot just outside the University of Memphis, "imports" its grease from the legend, getting that same super-flavorful, aged taste. Because it's already 3am and you're ordering a burger cooked in decades-old grease, go ahead and get the Two Timer: it's double patties, double cheese, and exactly what you need at that point in your Saturday night. If you've never been to Blimpy Burger (or Krazy Jim's Blimpy Burger if you're feeling formal), then you're probably going to mess up the order. And this is one of those spots that's going to sass you when you do. So let us help you save face and pretend you're an experienced Wolverine: order a triple on a plain roll with grilled onions & peppers and add that American cheese on at the end. Skip the condiments request. And once you've eaten one burger and are feeling confident, go try again: there's basically infinity topping, bun, and cheese combinations and you may just need to enroll to have enough time to try them all. The fries, my God they're good (esp the breakfast ones with egg, bacon, and cheese on them), but the burger is somehow my God better. The buffalo is the signature one and deservedly so, but the chorizo burger is also a solid move, as is the bacon and jalapeño -- the burgers are massive, the toppings plentiful, and there's a line all... the... time. Throw in the fact that this place is also a legit beer bar, is three short blocks from campus, and gets packed even at like 2pm, and you've got yourself a college burger hero spot. But wait! 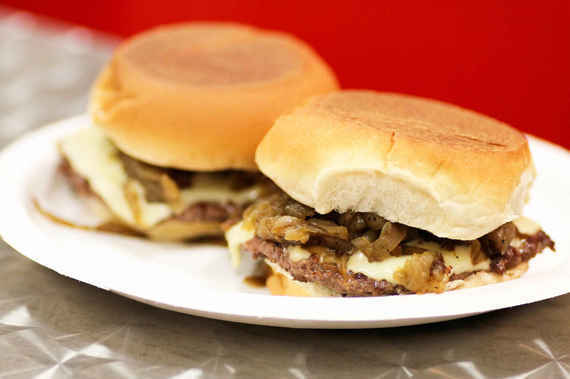 There are still 11 more amazing college burgers on the full list, over at Thrillist.com!